Here's a great contribution from a reader identified as "Kids Music Fan from Boston". It's an album of safety songs starring Yogi Bear, Boo Boo, and Cindy Bear. There's a lot of neat catchy stuff here. I don't think this is Daws Butler voicing Yogi though. 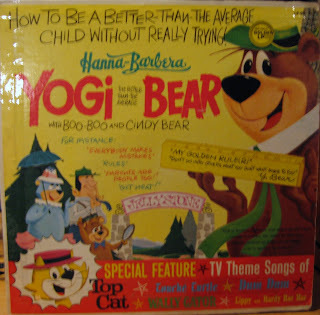 I could be wrong here, but the voice of Yogi sounds an awful lot like Stan Freberg to me. I had heard somewhere that he had done voice work on some of these records, but I have no proof that this is him here. What do you guys think? Whoever it is did a really good job with Yogi's vocal mannerisms. Boo Boo and Cindy don't fare quite as well though. As a bonus, the album includes the theme songs to Top Cat, Touche Turtle, and other cartoons. I like these because they're extended versions of the theme songs we're familiar with. Anyway, I hope you guys enjoy this. Thanks again Kids Music Fan from Boston! Click here or here or here to download! And now to round out the trilogy(?) of Tifton's DC hero albums, here's "Songs and Stories About the Justice League of America", donated to the blog by "Herr Anonymous". 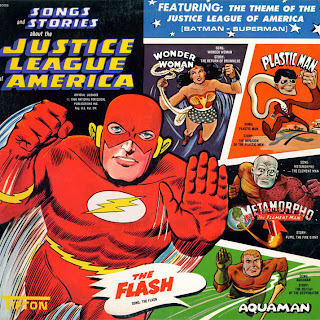 It contains a rousing song about the Justice League ("Are you ready?" "YEAH!" "Are you with it?" "YEAH!") 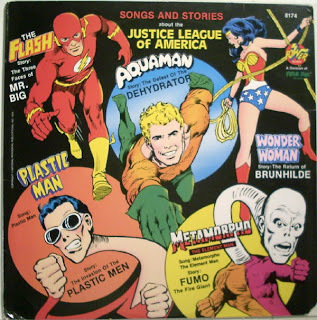 and a song and story each for Wonder Woman, Plastic Man, Metamorpho, Aquaman, and the Flash. Has this group (including Superman and Batman who make the roll call but are otherwise not represented here) ever been the lineup for the Justice League?? There's lots of neat stuff here with toe-tapping tunes and fun stories. I think one of my favorite odd things is in the Aquaman story. Two sailors are talking in a lighthouse on a far-off island. They hear on the radio that their supply ship has mysteriously disappeared. Suddenly Aquaman and Mera are there talking to them. They talk for a little while and then just as suddenly Hydro (the villain of our piece) shows up. They never explain how they just seem to appear out of nowhere. I guess they didn't have time to explain that part! According to my source, this is actually a combination of the Tifton Records album and the later released Power Records version. Hope you guys enjoy this. Thanks again, Herr Anonymous!! Here's the perfect companion to the Superman Musical Stories album I shared earlier. 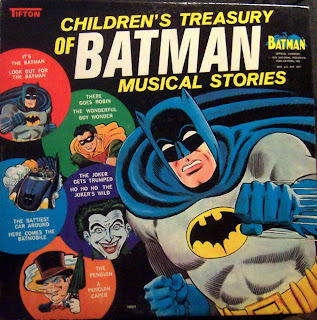 This one features two songs each for Batman, Robin, the Joker, the Penguin, and the Batmobile. The record credits the group "The Merriettes" as the artist on these songs. Anybody here familiar with them? Here's another question. On the song "Ho Ho Ho the Joker's Wild", is it just me or does the intro sound exactly like the theme to Casper the Friendly Ghost? And if so, why?? 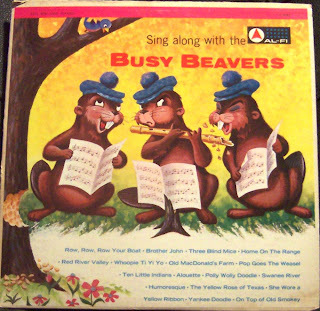 This is the album I meant to put on here after the Busy Beavers album. 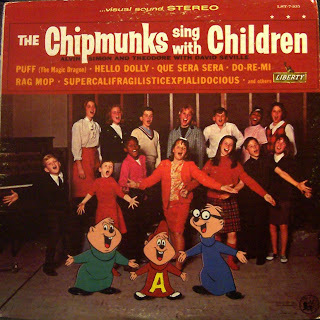 I like the Chipmunks and have a number of their old albums, but I had not heard of this out-of-print one from 1965 until recently. It was an interesting experiment, mixing the sped-up voices of Alvin, Simon, and Theodore with a children's chorus (the Jimmy Joyce Singers), but it's a nice change. And you can tell that the budget allowed for a more up to date collection of songs used here as well. Hope you like it! This one's just indescribably goofy. It stars the Happy Hamsters, another Chipmunks knock-off. If you'll notice by looking at the track list, half of these songs are instrumentals from movies. 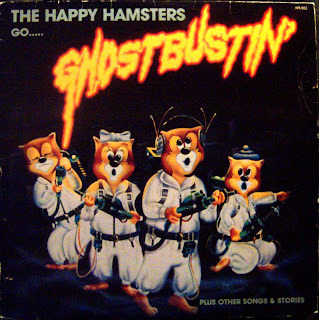 In those, the Happy Hamsters pretend that they are in the movie in question. The jokes aren't very good. For example, here's one from "Imperial March": "We've got to find Luke and the rebels!" "Who are they?" "A punk band from Queens." HAHAHAHAHAHA...WHA??? Anyway, this does have its own bizarre charm, so I hope you enjoy it! I'm sick at home today, so I figured it would be a good time to throw another album on here for you. 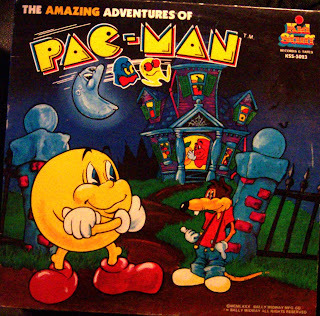 Here's a crazy one that came out in 1980 featuring Pac-Man. I don't know what to say about this, other than it's just plain nuts! For example, see that rat on the front cover? He knows where the ghosts are hiding, and wants to make a trade with Pac-Man for the information. Pac-Man trades his name, so the rat can now be known as (wait for it) Pac-Rat! They don't discuss whether that makes Pac-Man just "Man" now. I wished this record was in a little better shape, but I cleaned it up as best I could. Anyway, take a listen to this one. Irritating voices, annoying songs, and confusing story; sounds like Way Out Junk to me! Hi, I'm back again with another fun album for you. This 1985 record was put together by the Honeymooners fan club called R.A.L.P.H. (The Royal Association for the Longevity and Preservation of "The Honeymooners"). It compiles some old songs performed by Art Carney (one in character as Ed Norton), Jackie Gleason, and even a Stan Freberg parody. 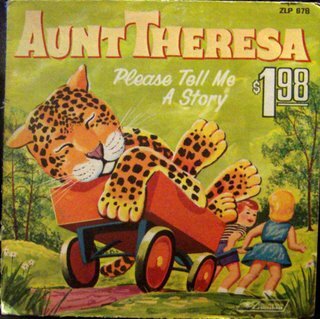 It also has two new songs: "I Want a Wife Like Alice Kramden" and the R.A.L.P.H. 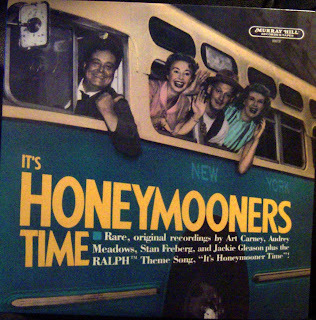 theme song "It's Honeymooners Time". Hope you like it! Hello again! Sorry about the delay in getting a new album here for you. Between having family staying at our house for the holidays, scrambling to find a new file host, and beginning to transfer old files over before the current ones disappear, it's been pretty hectic! 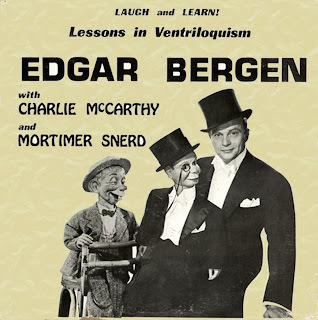 Anyway, this features Edgar Bergen and his buddies Charlie McCarthy and Mortimer Snerd. In it Bergen gives tips on learning to talk without moving your lips, throwing your voice, and on the kind of material to use for your act. This is a neat old record, and I hope you like it! UPDATE: SonicBlu sent me a better cover image for this, so that's the one I'm using now. Note that the cover image in the zip file is the old scribbled-on one, so do a right-click on the image above and "Save Image As..", and you can use this nice cover too! Thanks SonicBlu!! 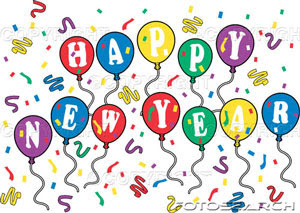 Happy New Year from Me and Bob Hope! Hey Gang! Well, it was quite a year last year. I started this blog about six months ago and, while it's had its ups and downs, I hope to keep going with it.